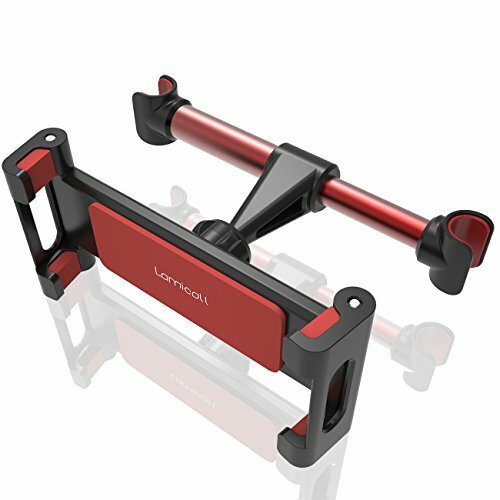 For universal tablets and smartphones from 4.7 to 13 inch, such as Surface pro, Amazon Kindle Fire tablet, Fire hd 8 10, Nintendo Switch Console, headrest mount. Apple tablets and smart phone cradle for New iPad 9.7 2018 2017, iPad Pro 12.9 10.5, iPad mini 2 3 4, iPad air 1 2, iPhone SE, iPhone 5 6 6s 6 plus 7 7 plus 8 X, car headrest mount holder. Android tablets for 11.6 10 10.5 9 7 inch 10inch tablet, Samsung Galaxy Tab, Samsung galaxy 10.1, Samsung galaxy S3 S2, Lenovo tablets, kids tablets, E-reader, kindle, Asus, Nexus, Dell, LG , Sony, car tablet mount holder. Kill boring time in your car - dvd player holder, reading with kindle, enjoy a great movie with phone and tablets, playing games with Nintendo Switch, having a video talk with friends and families. Make sure your headrest length is less than 5.9 inch and the diameter is less than 0.6 inch, otherwise you will not be able to install the car headrest holder. If your iPad is less than 8 inch, install your iPad level in the mount and rotate the mount to the angle you want. 【Universal Compatibility】 Lamicall Car Headrest mount for kids works with all 4.7- 13-Inch devices, such as new iPad 2017 Pro 9.7, 10.5, Air mini 2 3 4, Accessories, Samsung Tab, E-reader, Kindle fire, Nintendo Switch, Smartphones and Tablets. 【More Convenient & Enjoyable】 Universal Headrest Cradle will bring you a great fun when watching movies, reading, playing games and listening to music with no hands during long car journeys. 【High-quality & Easy Installation】 Stand for car headrest was made of Sturdy aluminum and ABS materials. Just press the headrest mount between back seat, installed immediately. If you are not satisfied with it, please feel free to contact us, we will give you a pleasant solution. If you have any questions about this product by Lamicall, contact us by completing and submitting the form below. If you are looking for a specif part number, please include it with your message.